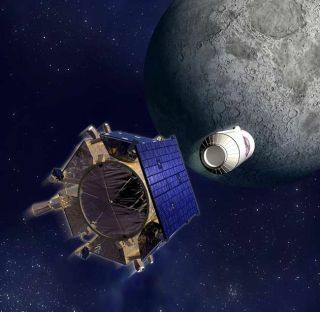 An artist's depiction of the LCROSS moon-smashing mission as the Shepherding Spacecraft (left) pulls free of the Centaur upper stage impactor. Pioneer Venus Multiprobe sent one large U.S. probe and three smaller versions diving toward different regions of Venus on Dec. 9, 1978. Correction: The amount of debris expected to be kicked up by the LCROSS Centaur rocket stage impact has been corrected.